We take a look at our top cordless circular saw to suit any budget. For straight, accurate and smoothly finished cuts, you will need a circular saw. Although most circular saws are corded, the cordless ones are becoming more and more popular. They offer a convenience that their corded counterparts just can’t provide. In the absence of a cord to constantly look out for, you can do your work quicker and more safely. When using cordless circular saws, you also won’t need to worry about the availability of a power outlet. They use batteries and you can even buy an extra set so that you can work for a long time without needing to charge them. However, cordless circular saws can be less powerful than their corded counterparts. The cordless circular saws featured in this review were selected due to their good performance, helpful features and price. We picked a high quality saw for every price range. In this review, you will find a budget buy, a moderately priced option and a high-end choice. This lightweight cordless circular saw is quite impressive for its price range. It comes with a host of features that make your cutting experience memorable for all the right reasons. One of its most outstanding features is the fact that it allows for easy adjustment of both the cutting depth and tilt angle. No tools are required for such adjustments. We also love that this cordless circular saw comes with an LED job light to illuminate the cutting area. This results in higher cutting accuracy even when you are working in places with low lighting. When you buy the Einhell TE-CS Li Solo, you also get a saw blade, a saw blade wrench, a parallel stop, and operating instructions. 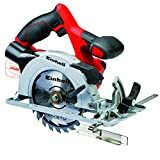 If you are looking for an affordable cordless circular saw that is light, compact and easy to use, the Einhell TE-CS Li Solo is right up your alley. The Ryobi R18CS-0 is in the ONE+ collection of power tools that use the same battery system. As such, if you already have a ONE+ battery system, you won’t need to get a new one. This battery system can be used by over 50 Ryobi power tools and allows you to build a personal collection of tools without having multiple batteries and chargers hanging around. This saves you the money you would have used to buy multiple chargers and batteries. In this way, you can get the most value out of your purchases. When you order the Ryobi R18CS-0, a single thin kerf blade is shipped with it. Extra blades, batteries and charges will have to be bought separately. While great for the average DIY enthusiast, this cordless circular saw is unsuitable for the professional. It can’t handle the daily cutting of tough materials. Professionals are better off with a more powerful saw. If you are willing to spend more than a little cash on a high-end machine, the DeWalt DCS391N-XJ is just what you need. It has several features that make it stand out. Here are some of them. The following items are shipped with this DeWalt cordless circular saw. The DeWalt DCS391N-XJ is a powerful cordless circular saw that can be used by both professionals and DIY enthusiasts. If its price is within your budget, you should definitely get it. While the Einhell TE-CS Li Solo and Ryobi R18CS-0 cut at a faster speed than the DeWalt DCS391N-XJ, they aren’t as powerful as the latter. 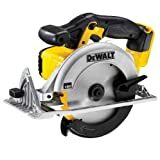 This DeWalt cordless circular saw is powerful enough to cut through 55 mm of wood, something that the other saws in this review aren’t able to do. Due to its great power, both professionals and DIY enthusiasts love it. It is one of those saws you can buy as a beginner and use all the way to professionalism. It also helps that it has long battery life and comes with unique features that are noticeably missing from the other two cordless circular saws. Although it costs a pretty penny, this DeWalt cordless circular saw is definitely worth the extra money. It is well equipped to handle whatever task you throw its way. Any tool enthusiast can tell you how important circular saws are and how difficult it is to choose the best one. With the advent of cordless technology and powerful Lithium-ion batteries, the number of circular saws to choose from has increased, making it much more difficult to make a choice. This is the main reason we came up with this detailed review. A lot of research went into coming up with it and we hope that it has made your selection process much easier. Remember, all the cordless circular saws featured here are high performing and come with a bunch of helpful features. With a high-quality cordless circular saw for each price range, this review has something for everyone.